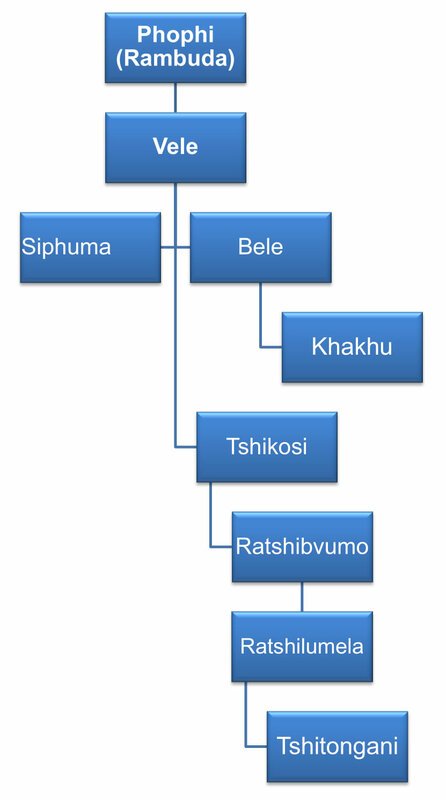 Raluswielo and Rambuda settled at Vhuphani (Ha-Tshivhasa), with Raluswielo being the Khosi of Vhuphani. Rambuda was at Lunungwi, while Raluswielo was at Dopeni. Rambuda was a hunter and one day he crossed the Mutale River and found himself at Dzimauli which was ruled by a Khosikadzi (woman chief) called Nyafhasi (also known as Nyafukedzani). This chiefdom comprised of areas such as Gogogo, Pile, Tshixwadza, Fefe, Luheni, Dzamba, Ha-Madala, Tshamulumbwi, Helula, Ha-Mabila, and Muswodi. It is believed that Nyafhasi was King Thohoyandou’s sister and was placed at Dzimauli by King Thohoyandou. Rambuda fell in love with the land of Dzimauli and later conquered it. Khosi Nyafhasi is said to have fled to Makonde, which was under Ravhura. It is argued that Ravhura gave Nyafhasi the land of Tshaulu. Even up to this day the land of Tshaulu is ruled by women. After word got to King Munzhedzi Mpofu that Rambuda had conquered Dzimauli, Munzhedzi sent warriors to dislodge Rambuda from Dzimauli. But the warriors could not dislodge Rambuda from Dzimauli since the area is very mountainous and the terrain is difficult to negotiate. Rambuda paid tribute to Raluswielo. Raluswielo Tshivhase died at Phiphidi and was succeeded by his son Luvhengo Tshivhase, whose reign was short lived. Luvhengo was succeeded by Ligegise. Rambuda also died at Dzimauli and was succeeded by his son, Vele Rambuda. Vele refused to pay tribute ‘to a boy’, Ligegise Tshivhase. The Tshivhases, under Ligegise, tried very hard to dislodge Vele Rambuda from Dzimauli, but failed. They could not negotiate the difficult terrain of Dzimauli. 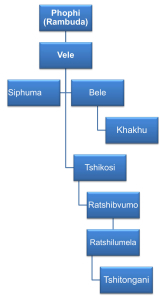 Khosi Vele Rambuda had 14 sons: Bele, Siphuma, Tshikosi, Makhomisane, Mashila, Nngwana, Madula, Mukhaiphi, Thukhuthwane, Manyelani, Muditambi, Khakhu, Luvhengo, and Vele (named after his father). These were brave warriors who defended the land of Dzimuali against attacks launched by the Tshivhases. Vele Rambuda died and his children clashed over the chieftaincy. Violent confrontations ensued. One faction installed Vele’s first son, Bele. But the other faction despised Bele and favoured his younger brother, Tshikosi, even though Bele and Tshikosi were brothers and not half-brothers. The Ramabulanas and the Tshivhases took advantage of the chaotic situation in Dzimauli and decided to interfere. The Tshivhases were bitter that Vele Rambuda had refused to pay tribute to them and had called Ligegise Tshivhase a boy. The Tshivhases finally managed to dislodge Bele Rambuda from Dzimauli. This was due to the assistance they got from a group of people from Dzimauli. This group was led by a man named Mamphidzha who had a disagreement with Bele Rambuda. The Tshivhases installed Bele’s half-brother, Mashila, as the new chief of Dzimauli. Mashila paid tribute to the Tshivhases, and for a while it looked as if the Tshivhases had won Dzimauli back. Tshikosi Rambuda fled to Songozwi, Ha-Ramabulana, and was welcomed by Makhado Ramabulana who was the king at the time. Bele Rambuda settled for a while at Khavhambe (known today by the colonial name of Wylliesport). He later settled at Mpheni village (Elim), outside present day Makhado town. Bele Rambuda was, however, not happy that he had been dislodged from Dzimauli. He was depressed all the time and desperately wanted to return to Dzimauli. After trying hard to convince whoever cared to listen, to help him return to Dzimauli, he invited Swazis from Swaziland and Ndebeles from Zimbabwe to help him fight Mashila and the Tshivhases. But he created more enemies than friends. When word got out that Bele had invited Swazi and Ndebele mercenaries, Venda people everywhere got scared because they thought he wanted the mercenaries to conquer the whole of Venda. It was for this reason that King Makhado turned against him and plotted to have him killed. Bele, however, failed to get the support of both the Swazis and the Ndebeles. Bele returned from Zimbabwe and settled at Mphego village. King Makhado and Bele’s younger brother, Tshikosi, decided to eliminate him for his attempts at inviting foreign mercenaries to Venda. They lured him to his death by promising him the chieftainship of Tshiendeulu and Khavhambe (Maname). They also promised to help him recover Dzimauli. Bele believed that he would be crowned as Khosi of Tshiendeulu and Maņame by Makhado. A ‘coronation party’ was thrown for him at Mphego village. He was made to consume huge amounts of sorghum beer on the day of the ‘coronation’. Instead of being made Khosi, Bele was strangled to death by a group of men led by Mashige, the Chief Commander of the Songozwi Regiment. After Bele’s death, Tshikosi Rambuda, with the aid of the Songozwi regiment, decided to re-conquer and reunite Dzimauli which at the time was ruled by Mashila’s widow, Nyatshitahela. The first area to come under attack was Gogogo, which was ruled by Tshikosi’s half-brother, Siphuma Rambuda. Siphuma was defeated and he fled to Tshamulungwi. The previous ruler of Gogogo village, Negogogo, who was kicked out by Siphuma, was restored to his place by Tshikosi. Tshikosi settled at Ha-Madala and later attacked Tshixwadza and Luheni. Tshikosi also attacked Siphuma at Tshamulungwi. Siphuma fled from Tshamulungwi to Ha-Tshivhasa. Nyatshitahela also fled to Ha-Tshivhasa and left no ruler at Dzimauli when she heard that Tshikosi was busy re-conquering villages under Dzimauli. The Tshivhases sent Siphuma Rambuda to Dzimauli. Tshikosi and the Songozwi regiment’s initial attempt at dislodging Siphuma from Dzimauli ended in disaster after they lost one of their senior commanders, Madzida. But their second attempt was successful. They managed to get into Siphuma’s royal yard and their first victim was Siphuma’s son. Siphuma fled to HaTshivhasa. Tshikosi became the undisputed Khosi of Dzimuali. He gave Ha-Madala to Bele’s son, Khakhu Rambuda. HaMadala is today known as Ha-Khakhu.